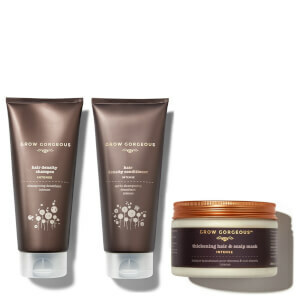 A Grow Gorgeous haircare duo containing a shampoo and mask designed to focus on cleaning and nourishing hair in a simple two-step process. Feed your hair for gloriously thick and full strands from root to tip with the Grow Gorgeous Hair Density Shampoo Intense. Put some life back into those locks with the ultra-concentrated formula infused with Amino Acids, Biotin and B-vitamins to visibly increase hair density, while each follicle is stimulated with the inclusion of caffeine to wake up the roots. Hair Type: Limp, lifeless hair in need of support to grow longer and stronger. Works best for fine hair. Suitable for coloured or natural hair. Visibly increase hair thickness* and softly nourish your scalp with the Grow Gorgeous Thickening Hair & Scalp Mask Intense. The unique multi-mask is enriched with Amino Acids and Caffeine to thicken thin locks, feeding your strands with Biotin and Pea Peptides to ensure hair is healthy, thick and full looking. Designed to deeply hydrate without weighing hair down, Coconut Oil and Hyaluronic Acid intensely moisturise the scalp, keeping it in optimum condition to achieve ultimate hair health. Shampoo: Das Haar gründlich nass machen und anschließend eine großzügige Menge auftragen. Aufschäumen und von der Kopfhaut bis zu den Spitzen einmassieren. 1 Minute einwirken lassen, anschließend ausspülen. Für optimale Ergebnisse anschließend den Grow Gorgeous Hyaluronic Density Conditioner verwenden. Maske: Nach der Haarwäsche anwenden. Die Thickening Hair & Scalp Mask Intense großzügig auf das Haar und die Kopfhaut auftragen. Gründlich in die Kopfhaut einmassieren und 10 Minuten einwirken lassen. Gründlich ausspülen.